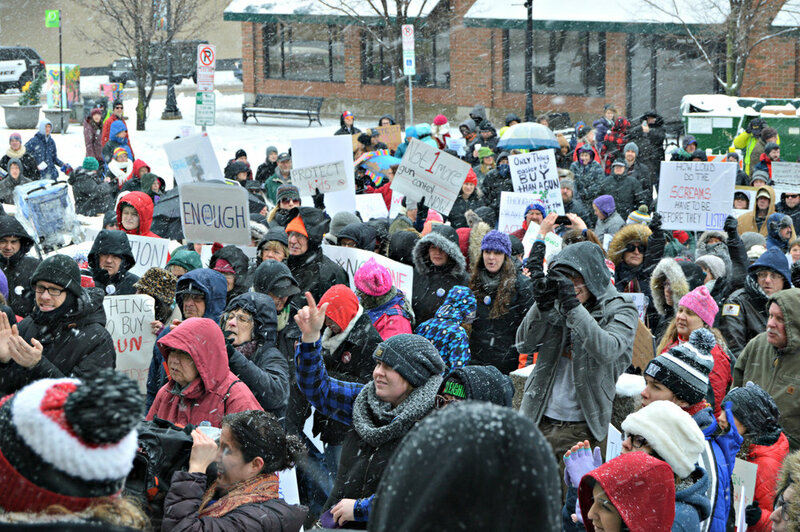 Heavy snowfall and gusting winds didn’t stop hundreds of protesters from gathering in Downtown Bloomington Saturday morning to speak out against gun violence. Supporters crowded the steps of the McLean County Museum of History to hear students sing songs and deliver personal messages of what it’s like to grow up in the shadow of hundreds of U.S. school shootings in their lifetime. The group later marched along Main Street, convening at the Bloomington Center for the Performing Arts. About a dozen counterprotesters also attended the rally, waving signs and flags in support of Second Amendment rights. The Main Point: The local March for Our Lives rally was just one of hundreds of student-led events nationwide calling on legislators to enact sensible gun reform. Over 50 area high school students and community leaders joined forces to organize the event in Bloomington, with support from Voices of Reason, Not in Our Town Bloomington-Normal and other advocacy groups. For state and federal legislators to enact stricter background checks, ban bump stocks (a gun accessory used to mimic automatic fire on a semi-automatic weapon) and increase of the age of legal gun ownership to 21 for all firearms. More Federal funding for research on gun violence as a public health issue. For supporters to become more actively involved by contacting state and federal legislators, registering to vote and knowing where candidates stand on important issues. NCHS students also created a petition for stricter gun laws. “We want a future where everyone feels safe in their schools, communities and lives,” said Allie Beam, a 16-year-old University High School student. Rewind: Saturday’s event followed walkouts at area junior high and high schools March 14, one month after a former student shot and killed 17 students and faculty at Marjory Stoneman Douglas High School in Parkland, Florida. The Data: More than 400 people have been shot, 138 fatally, in over 200 U.S. school shootings since a gunman killed 20 first graders and six adults at Sandy Hook Elementary School in Newtown, Connecticut in 2012, according to a New York Times report. Key Takeaway: Students locally and nationally feel politicians’ inability to enact sufficient gun reform thus far means the citizens themselves must lead the charge to increase protection against gun violence. “We will be heard, we will be respected, and we are making the change right now,” said Wenger.